Do you have flat feet? Do you have trouble running because of the incredible pain that courses through your body? If so, read on to learn about the 5 best running shoes for women with flat feet. When it comes to running, flat feet are the worst. To put it plainly, a flat foot is one without arches. Most feet are slightly curved inwards around the middle. However, flat feet are, well, flat all the way through. While flat feet themselves don’t cause trouble in running, they do lead to overpronation, which, in turn, leads to excruciating pain. However, this issue is easy to remedy. You simply need to purchase the right shoes. The right shoe can compensate for the flat feet and allow you to run normally. Overpronation is neutralized and you can run without experiencing any pains. In this article, we’ll give you an overview of the 5 best running shoes for women with flat feet. In order to compile this list, we personally had several women with flat feet wear dozens of the best shoes and offer their feedback. We also consulted physical trainers and podiatrists to compile this conclusive list of the best running shoes for women with flat feet. The ASICS GEL-Kayano 24 is one of the best selling running shoes for women with flat feet and it’s easy to see why. This shoe has been designed in a manner so as to amplify comfort and stability, and it has received rave reviews from customers. It can be used for running short or long distance without searing pains. In terms of aesthetics, these shoes come in 11 different pastel shade combinations like Blue Purple/Regatta Blue/White, Flash Coral/Black/White, and many others. The upper layer of the shoe is made with synthetic fabric and the rubber sole is specifically designed to provide strong traction even on a rugged or slippery terrain. It has a shaft that measures low-top from the arch. This shoe uses the I.G.S (Impact Guidance System) Technology to facilitate the foot’s natural gait from heel to toes, despite the flat-footed component. The Fluid Ride Midsole offers great cushioning properties to enhance the shoe’s bounce and lightness, while also providing great shock absorption, making it ideal for long-distance runs. Furthermore, the Fluid Fit Upper technology incorporates multi-directional stretch mesh so that it can adapt to the wearer’s foot like a glove, providing an ideal fit. Made of synthetic fabric with rubber soles. Some users complain that it’s heavy. Fits too tightly for wearers with wide feet. 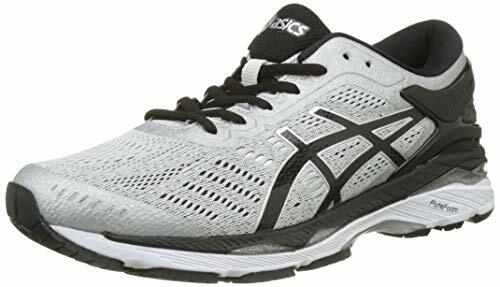 The ASICS GEL-Kayano 24 is the best running shoes for women with flat feet because it provides maximum comfort, corrects overpronation, and still manages to be designed in an extremely pleasing style. 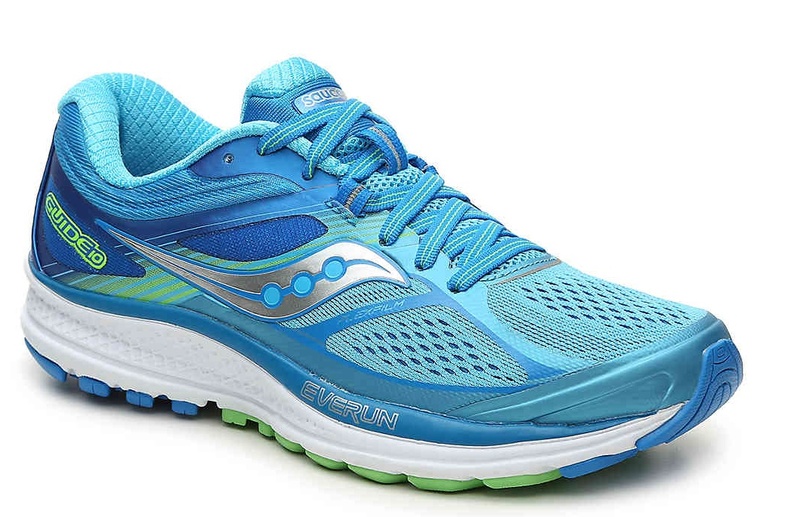 The Saucony Guide 10 iusts a series of reasonably priced running shoes for women with flat feet. It’s available in 6 different color combinations and styles — Light Blue/Blue, Grey Teal, Teal/Navy/Pink, Silver/Berry, Purple Navy, and Maru/Black. Comers often comment that the shoe appears to be fast, and that’s exactly how you feel while wearing it. This shoe has several layers of cushioning, a feature that’s greatly appreciated by endurance runners with flat feet. The topsole of the show uses the Everun technology which provides a soft landing with shock absorption to keep overpronation at bay. Even the midsole has some added structure to correct flat feet. These shoes are extremely durable and can last several months or years of constant use. For one of the cheapest shoes of its kind, that’s a pretty great deal. Made of engineered mesh fabric. Great support and shock absorption. Several customers have complained that the guide is too tight and that extensive use causes blisters. The Saucony Guide 10 is one of the most attractive and reasonably priced running shoes for women with flat feet. Despite some complaints, it’s widely hailed to be one of the most comfortable shoes out there, with several flat feet corrective features. New Balance 1260v7 is at the top of the line when it comes to stability and durability. They’re also aesthetically pleasing with some bright and sleek colors available. The sole of the shoes uses Abzorb cushioning to help distribute the shock evenly. And the Fuel Cell midsole provides some bounce for quick and easy liftoff. It has been structured in such a way that flat footed people might land on the midsole but they always push off with the forefoot. The biggest annoyance here is that the sole is quite rigid, which, in turn, makes the whole shoe feel bulky. However, it’s coupled with a low 8mm drop which provides greater stability and allows you to push yourself faster off the ground. Available in 6 color combinations — Bright Blue, Dark Grey/Purple, Reflection/Vintage Indio, Pisces Blue/Lime Glo, Steel/Poisonberry, and Polaris/Pigment. Made of synthetic fabric and sole. Provides more stability than all other similar shoes. 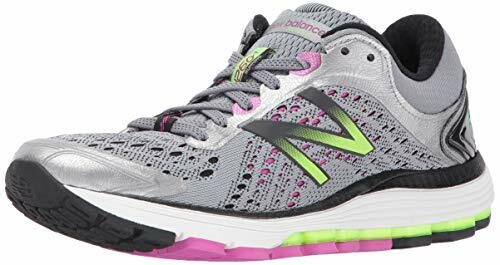 New Balance 1260v7 is one of the most durable and stable running shoes for women with flat feet. It might be a bit bulky, but it will stay with you for a long time. Mizuno Wave Inspire 13 is named as such because it makes use of a Wave Technology for its shoe construction. In terms of design, it mimics patterns naturally found in nature and ocean waves and replicated them in a series of natural-seeming color combinations. The “Wave” in the title doesn’t just refer to the aesthetic pattern, but also the wave plate used to displace shock impact across the feet, making it ideal for women with flat feet. The dispersed shock allows women to run for a longer period without fatigue setting in. Mizuno also provides great padding and support without adding to the weight considerably. As such, it’s a great option for overpronators and women with flat feet. Available in 7 different color combinations and styles such as Malibu Blue/Pink, Silver/Tile Blue/Griffin, Blarney/Electric, and various others. Made of textile and synthetic fabric with mesh overlay. Available in various attractive styles. Some customers complained about sizing issues. 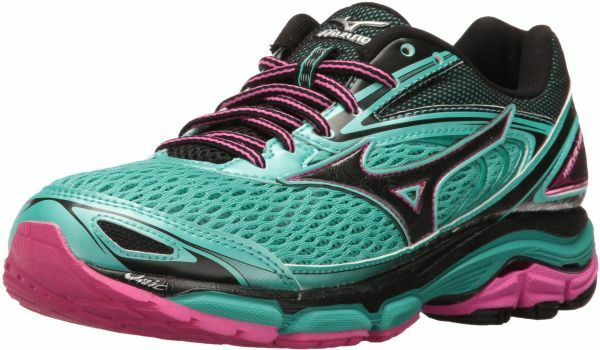 Mizuno Wave Inspire 13 is a very stable and aesthetically attractive running shoe for women with flat feet. 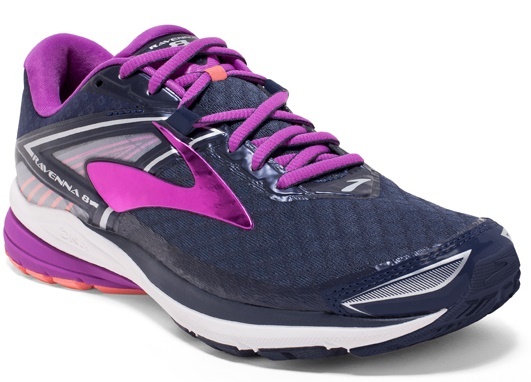 Brooks Ravenna 8 offers a series of colorful and attractive running shoes for women with flat feet that are meant specifically for long distance running. It’s made of a mesh and synthetic fabric and available in 5 different color combinations — Peacoat/Purple Cactus Flower/Fusion Coral, Silver/Clematis Blue/Very Berry, Black/Silver/Aquarius, Very Berry/Aqua Splash/Lime Punch, and Black/Diva Pink/Plum Caspia. In terms of features, its greatest asset is the Diagonal Rollbar medial post which enhances the comfort and durability while providing smooth transitions. However, the comfort and durability don’t come at the cost of speed. It features a BioMoGo DNA midsole and rebounding rubber which provides some buoyancy to help you stay light on your feet and run fast. This feature helps to balance out the relatively heavy weight of the design. Synthetic and mesh fabric construction. A little on the heavier side. Provides only medium pronation, so if you’re completely flat footed you can find shoes that offer more comfort. If you want a shoe that looks awesome, provides great support and is also extremely comfortable, Brooks Ravenna 8 is the one for you. However, it doesn’t offer complete pronation support like the other shoes in this list. I hope this article has helped you decide which running shoe is ideal for your feet and your needs specifically. All of the shoes mentioned in this article have been thoroughly vetted by our team, however, personal opinions may differ. As such, if you would like to recommend any other running shoes for women with flat feet, we’d love to hear you out. Feel free to comment on our selections down in the comments section.